Configure Group Policy settings as needed to define the end user experience and security requirements for applications. Create the domain-joined application stack in AppStream 2.0. Create the AppStream 2.0 application in the SAML 2.0 identity provider and assign it to end users either directly or through Active Directory groups. For your users to be authenticated to a domain, several steps must occur when these users initiate an AppStream 2.0 streaming session. The following diagram illustrates the end-to-end user authentication flow from the initial browser request through SAML and Active Directory authentication. The user's browser posts the SAML assertion to the AWS Sign-In SAML endpoint (https://signin.aws.amazon.com/saml). 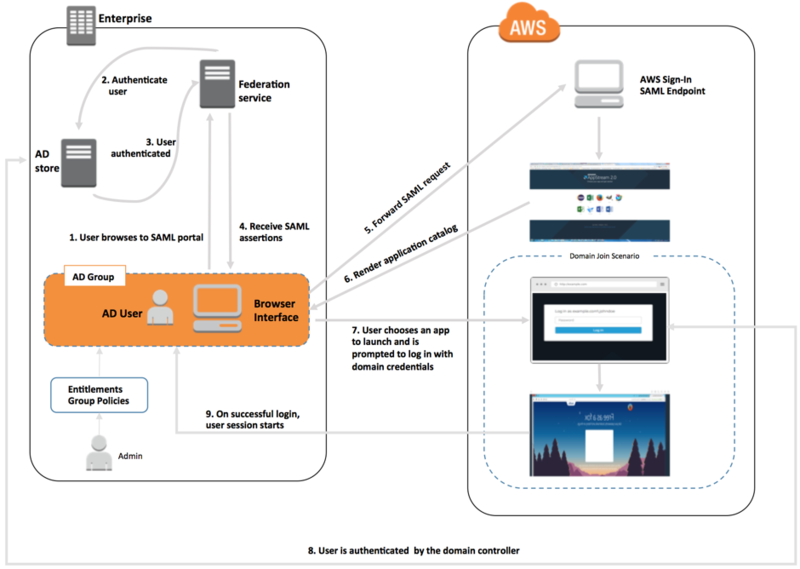 AWS Sign-In receives the SAML request, processes the request, authenticates the user, and forwards the authentication token to the AppStream 2.0 service. The user chooses an application and is prompted to enter login information for the domain. The domain controller is contacted for user authentication. After being authenticated with the domain, the user's session starts with domain connectivity. From the user's perspective, the process happens transparently. The user starts at your organization's internal portal and lands at an AppStream 2.0 application portal, without having to enter AWS credentials. Only Active Directory domain login credentials are required. Before a user can initiate this process, you must configure Active Directory with the required entitlements and Group Policy settings and create a domain-joined application stack.